It’s one of the great puzzles about Australian property. Why do prices keep rising, year after year? In recent history, prices have doubled every 7 years, fairly consistently. Now of course, past results are no guarantee of future performance, but what’s the key dynamic driving this result? And for some reason, this factor just keeps flying under the radar. And for the last 15 years(! ), I’ve been hearing people say, prices just shouldn’t be this high, so there must be a bubble. Prices will start falling any day now. If I had a dollar for every time I’ve heard that I’d probably have enough for a nice little 4-unit reno project on the Sunny Coast. I think you can see the fallacy in this. I don’t understand why kebabs taste so good, but my ignorance doesn’t mean that kebabs are going to stop tasting good at some point in the future. But ignorance hasn’t stopped any of the doomsday commentators in the past 15 years, I don’t expect it will start now. I think economists and Australians in general have a blind spot to this because the spaciousness of Australia – our endless rugged plains – is etched into the Australian psyche. How could there possibly be a shortage of land and housing in Australia? How could eskimos run out of ice to put the beers in? But that’s exactly what’s going on in Australia. Housing supply continues to lag further and further behind demand, which translates into sustained upward pressure on prices. This is the ‘shortage’ we’re talking about. And not only is there a shortage, it’s getting worse. This is the construction rate per million Aussie residents. What this captures is the fact that even though our population keeps growing, and especially quickly in the last 5 to 10 years, construction just hasn’t kept pace. In fact in 2013, we built fewer homes per million residents than we did back in 1984! 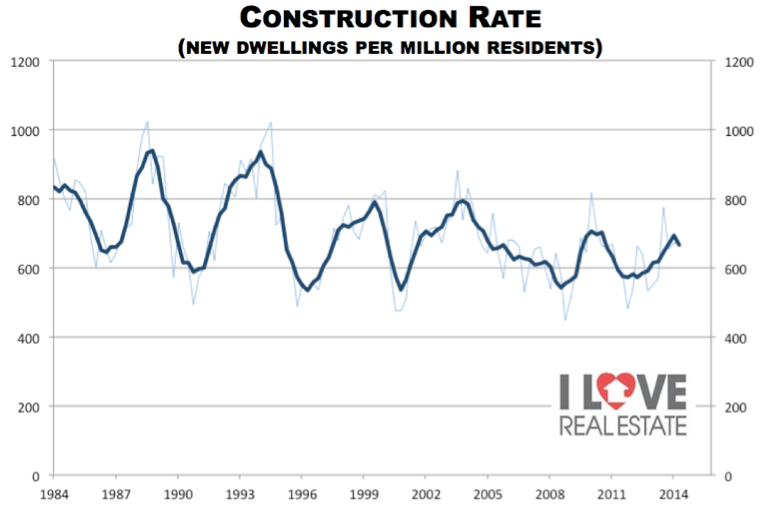 You can see that the construction rate is on a downward trend, which means the housing shortage is actually widening. But not only is the construction rate falling, but the housing ‘intensity’ of the population is increasing. 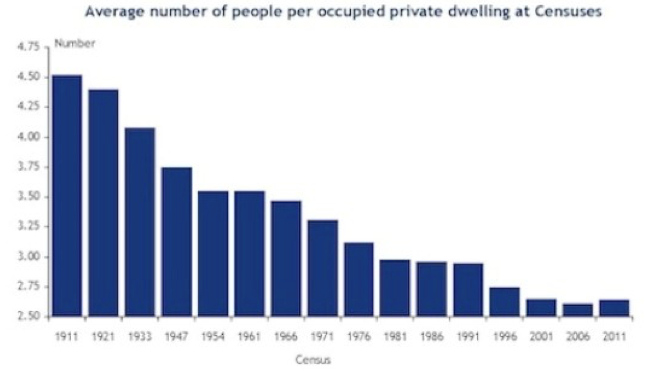 That is, we now need more houses to house the same number of people, than we did in the past. Let me explain. Take a look at this chart here. This is the number of people per dwelling in Australia, taken from the Census data. What it shows is that over the past 100 years, the number of people living in each dwelling has been on a consistent downward trend. Each home had an average of 4.5 people living in it back in 1911. Today, it’s a little over 2.5. Or think about it another way. Back in 1911, you needed 2 and a bit houses to house 10 people. Today, you’d need almost 4 houses. That’s what I mean when I say the housing ‘intensity’ of the Australian population has increased. There are some long-term cultural shifts behind these trends. We’re having fewer kids, on average. We live a lot longer, and spend many more years as ‘empty-nesters’. Family break-up is a lot more common than it was too, meaning that we’ve got more single people living on their own, or the situation where both mum and dad need a large multi-bedroom house each, because the kids spend some nights with mum, some nights with dad. All up, we just need more houses than we used to. But if we need more houses than we used to, we should see an increase in the construction rate. We should be building more houses per head of population. No. Not only are we not building enough to house the raw numbers of population, we’re not building enough to accommodate changing tastes in the ‘intensity’ of housing. I think economists have a blind spot to this shortage because they’re used to thinking in cycles. Most questions in economics are around the business cycle. Things go up for a while, then they go down for a while. This is the framework – or paradigm – that economists use. And so they look at rising house prices in Australia and just presume that it’s cyclical. Housing prices are in an upswing phase. Soon they will be in a downswing phase. But that’s just not how house prices are working. House prices swung up, but then never came down. Economists scratched their heads. Any day now. I’m sure of it. Any day now. Prices will have to fall. But what they thought was a cyclical swing, was actually a structural shift. This shortage has been 100 years in the making. And for the price rises associated with this shift to unwind – for prices to fall – these structural dynamics would need to reverse. We’d need to decrease the housing intensity in a huge way, or suddenly ramp up our construction rate. But I just can’t see what would do this. There are still cyclical dynamics at play, but they’re overlayed over these fundamental structural factors – an enduring housing shortage. It still surprises me how many people fail to see this. And ‘professional’ economists are still being overtaken by hacks like me in their blind spot.